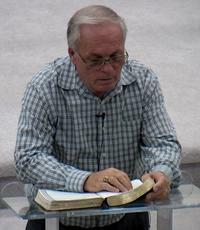 There is a form to the left provided for you if you would like to receive "Pastor Joe's E-news." There is news of coming events, Bible prophecy and other timely news. We need to be informed in these days we live and we must stay ready because the rapture of the Church could happen any day. We do not know the day or the hour, but we can see by Bible prophecy that His appearing is near. Fill in all the information and then click on subscribe. That is all you need to do to get started. This is a free newsletter so enjoy.